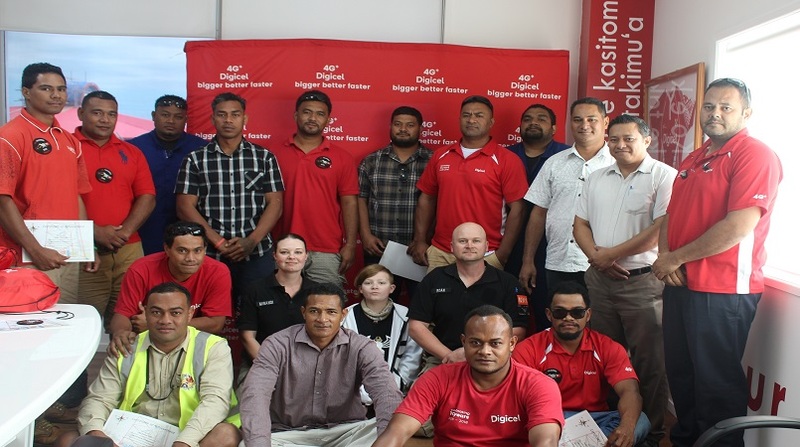 KN Training & Development out of New Zealand conducted a week long training in Tonga for field engineers, transmission engineers and ISP installation engineers. Roan Gouws and Minandi von Ludwig, training facilitators are Directors of KN Training & Development and are in Tonga for the second visit. A total of 16 participants including 13 from Digicel and 3 from the Ministry of Infrastructure took part in the training. The training was both in classroom setting and field exercises and provided the participants with re-certification on two major components. These included Working at Heights & Safety covering practical and fundamental elements of working at heights safely, with the right rigging equipment, best industrial knowledge and proven know how. The component on First Aid covered updated fundamentals in the procedures of administering First Aid, as well as the rules and regulations of being first responders to an incident (within the work environment or outside in public). In strengthening partnership with its external stakeholders, Digicel extended the invitation to two surveyors from the department of Building & Control of the Ministry of Infrastructure, to participate in the training course.